Denise is one of those rare people that are truly real when you meet them. She is warm and was a delight to talk with. Her performance at the UFO Expo was very funny and witty. She is such a talented actress and director. See her website for more information about her. Not everyone born in Hollywood, California, has famous family connections. 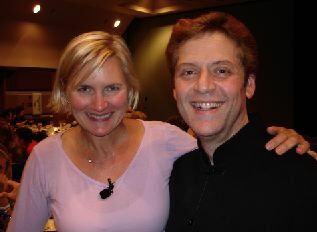 Denise Crosby's early and young adult life, however, were influenced by her status as Bing Crosby's grandchild and Blake Edwards's daughter-in-law. There is no doubt Crosby has steadily forged her own niche in the entertainment industry, from her portrayal of Lisa Davis on Days of Our Lives to the no-nonsense Lieutenant Natasha 'Tasha' Yar on Star Trek: The Next Generation, where she also played her own daughter, Romulan Commander Sela — a role she would reprise on the "Star Trek Armada" video game. Since her Star Trek days, Crosby has worked non-stop in television, notably as Dr. Gretchen Kelly on Lois & Clark: The New Adventures of Superman, as well as in high-budget features like "Deep Impact." Crosby has also starred in Stephen King's "Pet Sematary" and the Quentin Tarantino caper "Jackie Brown." One of her very first film appearances was in the Eddie Murphy vehicle "48 Hrs." Crosby has recently made time to star in and co-executive produce a feature documentary, "Trekkies" about the fans of Star Trek. Crosby is married to Ken Sylk and has one son, August William Sylk.